“We can begin by doing small things at the local level, like planting community gardens or looking out for our neighbours. That is how change takes place in living systems, not from above but from within, from many local actions occurring simultaneously"
We hope you find this site to be both informative and a useful resource. Comment 24/03/14: The public response of the Office of Regeneration (OoR) to the letter of support from Special Rapporteur to the United Nations Human Rights Council, Magdalena Sepúlveda Carmona, was to ignore it. However, the OoR did respond privately with a letter to the UN Special Rapporteur insisting what a great job they did consulting with residents and claiming that they want us involved. The letter from the OoR states that they have nearly completed "a structured consultation with key stakeholders (community based forums, local authority etc. )", but doesn't say that mandated residents groups have been excluded from this process, or that their proposals for “Capacity Building: Community Participation, Empowerment and Civic Engagement” were based on the diluted recommendations of the unpublished Nexus Report, which had actually envisaged that the development of an “agreed charter” would be “…endorsed by all relevant stakeholders (present and potential future)…” (Nexus p36). The letter also boasts that they received 274 submissions in respect of the Implementation Plan, but neglects to mention that the majority of submissions did not endorse the plan and that most of them (237) were from residents that had participated in the postcard campaign organised by our affiliated groups. The OoR also neglects to mention that the call for a Human Rights based approach to community participation in the BWRA & WGRA joint submission was studiously ignored in the Managers Report to Members, presented in City Hall on 24 February 2014. 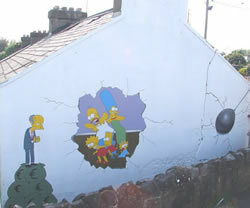 Other proposals, such as the orderly depopulation of areas through negotiation with residents on a block-by-block basis, were also ignored; the Council and the OoR will continue with it's destructive policy of boarding-up individual houses without any regard for the negative impact it has on the adjoining homes. We view this policy to be little more than bully-boy tactics aimed at forcing residents to surrender their homes for whatever pittance they are offered. It is lamentable that our Councillor's have adopted this plan as policy without any real debate, apparently they had more pressing matters to attend to; the renaming of a bridge. 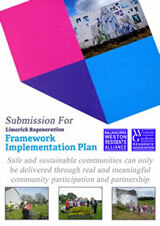 Limerick Regeneration Watch is now embarking on a national campaign to have the legislation introduced in line with the recommendations of the UN Special Rapporteur begriming with a Submission to the Seanad Public Consultation Committee on Key priorities and challenges facing the State in complying with Ireland’s obligations under the International Covenant on Civil and Political Rights. The local consultations have underpinned our 'right to be ignored', we need legislation to uphold our Human Rights. Depopulation: An appalling feature of Limerick Regeneration has been the depopulation of the estates to clear the land for developers. Regeneration Reports: Another feature of the regeneration process has been the large number of reports produced, most of which were commissioned by the Regeneration Agency and all of which were never implemented. Limerick Leader Ads: Due to the largely uncritical nature of the local media when reporting on regeneration it became necessary to buy space in the Limerick Leader. National Media Coverage: We have have had some success in recent times in getting reporters from national newspapers and television to visit the areas. Sociology of Regeneration: In 2012 The University of Limericks Department of Sociology ran an excellent seminar series on regeneration. Sponsorship: Community based events sponsored by Limerick Regeneration Watch and affiliated residents' organisations.